Hey Robin, These are wonderful! When you said you were doing ceramics I thought bowls. I love the cats especially the mix of cats and fish. Good luck with the show, wish I could come. I love them! You've been working towards this for a long time! congratulations! They are fantastic! Wish I could see your show, but maybe will have to visit your studio one of these days! Hope the show sells out. Robin, everything looks beautiful - the work and the site! Wow Robin, I now know why I've always been envious of you! Wonderful art, impressive site! A big fan of your work Robin . . .
very cool Robin! Thanks for showing me this website and great to finally see a picture of you! Rob, how great is your site!!!! Beautiful work...from a beautiful heart. 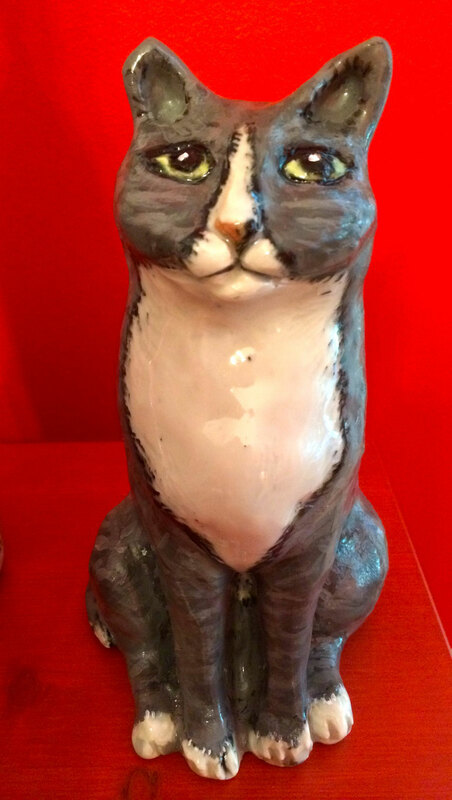 Hi Robin, I like the cat urns a lot! I think they're great.